The Alte Fest sits in downtown Windhoek upon a high point overlooking the CBD. Also known as the Schutztruppe Fort, it served as the German colonial power's military headquarters until after World War One and today houses the state historical museum. 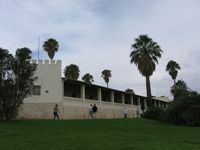 German commander Curt von Francois laid the foundation stones in 1890, making it one of the oldest buildings in Windhoek and a significant national monument. In fact, the modern city more or less grew around the fort. Although initially intended to be a military stronghold, the Alte Feste was never actually involved in significant military action. The building became dilapidated and got renovated extensively in 1963, declared some years afterwards as a national monument. Today, the museum's exhibition informs visitors of Namibia's history from its San origins to German occupation in 1884 and the resulting struggle for independence. The museum is a bit old-fashioned and rundown but still interesting. Emphasis is on the revolutionary struggle, with fascinating old photographs. A few blocks down the road, the Owela Museum showcases the rich and diverse ethnography of Namibia, and this museum tends to receive better reviews from tourists. Both museums are free, but donations are expected and appreciated. Opening times: Monday to Friday 9am-6pm, Saturday and Sunday 10am-12:00pm and 2pm-6pm (winter time closing time is 17.00).